Today we were learning how to add and subtract positive and negative numbers. Just the thought of it gives me the shakes ;) So I did a few things to *try* and make it a bit easier for the kids to grasp and thought I would share with you all. We began talking about number lines, as we were going to be using them throughout today. Using a number line as our starting point, I broke the equation down like this for the kids. OK..that is probably confusing to you, as you don't exactly know what was going on in class. I had the students create a human number line. One of my students was the "walker". He stood on the number line at the 6. The subtraction sign told him to then face the negative side of the number line, so he turned around to face negative. the -4 is a negative number, so it says to walk backwards 4 spaces. So, while facing negatively, he is walking backwards (which actually puts him more positive). We did a few of these problems, and with the kids actually turning their body in the right direction, then walking, the students seemed to grasp it. Next, each student made their own number line on their desk. I created this document for them so it would be easier. The kids cut out the pieces, glued them together, and had a big number line. They also cut out the little man. If you notice, he is facing opposite directions. They cut him out in a little square, then glued the two pieces back to back. This gave them a "walker" who could be turned in either the positive or the negative direction. Once the number lines and men were made, we worked on a few problems together, using the manipulatives, until they seemed to grasp the concept...and they did! It all seemed to fall into place for them, much better than it did last year when I just tried to teach them a whole bunch of rules. ;) We will get to that, but for now, I am happy that they are understanding how to use the number line to help them! Again, here is the document, in case you want to give it a try. I don't teach this concept in math, but I think it's just an awesome idea I had to leave a comment. Great idea! I will definitely think about using this to reinforce the concept with my class this year as the topic is always a struggle for some. This is so smart! I wish I had read this last year when I was teaching 6th grade math! Hi Stephanie! Amazing idea. Have you ever used Hands onEquations to teach integers? It really works too!! And thanks for stopping by Debbie! I really like this idea! And it like that it was both kinesthetic and visual. I love the way you engage the kids!!! What a great lesson! You rock! I think this is a great idea! I was thinking like Amy about how it is both kinesthetic and visual. Thanks for sharing! I love this post! We do something similar, but our picture is a car. And we call it "moving toward the sunny side" and "moving into the murky darkness " for moving toward positive numbers and moving towards the negative numbers... and there's backing up involved! But actually WALKING it... THAT'S what I was missing! I love how you teach concepts so CLEARLY. I'm always reading your blog thinking, "Yep, that would work" and "Yep, good idea!" BlogDom got a real treat when you came along. I have to review integers for The Test. I am going to reinforce the concept using your materials. THANKS for sharing. And thanks for being such a wonderful resource! I nominated you for an award.. come on over and check it out! Love it. I think it would work really well because of all the modalities the kids use. I've filed it away for a time I might need it! I LOVE THIS! I do a number line on the floor and the kids "hopscotch" when learning adding integers. I then teach them "Keep, Change, Change" to make subtraction problems addition problems. I will have to try your idea next year! Love your blog and especially love your end of year gifts for your kids... they will treasure that forever. Curious about your thoughts... I use "Keep, Change, Opposite" instead so that I can keep the idea of negative and positive numbers being opposites and will transfer to negative numbers in multiplication. "Negative of a negative" or "opposite of an opposite" or a double negative. I love this! I don't have to teach this yet, but I am definitely going to download it and use it in the future. You have made it a way that students would be able to understand! Thanks so much for the freebie! Thanks so much! I love this and will use it in the next few weeks. This is such a neat idea. I am always looking for something using differentiated instruction. This would be so easy to access also. Thanks for sharing such a great idea! I can't wait to try it next week when I RETEACH integers! I do the same thing complete with the human numberline. We call our little guy "Integer Man". Th kids love it. For subtracting integers, we end up chanting "Keep (they tap their desk), change (clap), change (clap), Then follow the rules for addition!" 'Keep" means keep the sign of the first integer the same. 'Change' means change the math action symbol (+ to -, or - to +). The second 'change' means change the sign of the second integer. Having anchor charts up for ready reference really helps my students. We chant the steps for adding and subtracting integers and the definitions of integers, magnitude, and absolute zero every morning while we are working on our integer topic. Just found your blog thanks to Laura Candler. Will be back often! I love the kinestetic practice here! I have high school students that struggle with this, and I will use this in the first weeks of school. Thanks! What a great idea! I will definitely be using this, thanks for sharing the document and step-by-step pictures! I love this!! I teach my kids with two-colored counters and number lines before I even touch the "rules". This is great for taking it to the next level! And for those of you teaching various "keep" methods for subtracting integers, try KFC! Keep Flip Change! For me, its something the kids remember since it relates to food! There is a game called Walk the Plank which approaches the concept in exactly this manner. I love your manipulative for the kids though. I don't think we give them enough hands on stuff to play with!! I love this! I am going to have the kids write their number on their dry erase index card necklaces for the "Human Number Line". Thanks for the great ideas! Awesome idea - thanks so much. My daughter was really struggling with this - and your method really helped her see the logic of it. Just the thought of teaching how to add and subtract positive and negative numbers gives me the shakes. So I did a few things to try to make it easier for kids to grasp. We began talking about and using number lines as our starting point. I wrote equations like this on the board for the kids: 6 - (-4) = 10 And then I had some of the students create a human number line. There was an over-sized number line on the floor, and each stood on a ‘shoe sized’ numeral on that number line. One student at a time took a turn as the "walker" for one of the math problems. 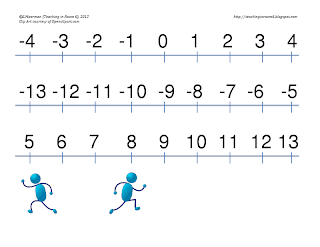 For 6 – (-4) = 10, the "walker" stood on the number line at the 6. The subtraction sign told him to then face the negative side of the number line, so he turned around to face the negative ‘side’. Because (-4) is a negative number, he walked backwards 4 spaces. So, while facing negatively, he walked backwards (which actually moved him toward the positive ‘side’). Got that?? We did a few of these problems, with each child turning his body in the correct direction, and then walking. The students seemed to grasp it. Next, the students each made a personal sized number line to fit on their desks. I created a document and all the students had to do was cut out the strips and tape them together. They also cut out two squares. Each small square had a little man in it. One square’s man faced right and the other square’s man faced left. The students glued the two pieces back to back. This gave them a "walker" who could be turned in either the positive or negative direction. Once the number lines and men were made, we worked on a few problems together as a class. They each used their own desk version of the manipulatives, until they all began to grasp the concept. It all seemed to fall into place for them, much better than last year when I just tried to teach them a bunch of rules. They will still learn the rules, but I am happy that they are first practicing the process, using the number line! Found this on pinterest. I have to teach this next year for the first time. I will definitely start with this! This is exactly what I need! I'm going to give it a try with my 5th graders tomorrow. Great post! Thanks for sharing. Pleas check out my site/blog http://www.diaryofafirstyearteacher.com.Thanks! I am student teaching in a fifth grade classroom. My students were comfortable with adding...but for some reason were not able to grasp the subtraction concept. I am going to try your idea in class tomorrow when I reteach the lesson. Thanks so much!! Thanks so much for sharing this idea! I really like the art/making and getting kids involved. I know how useful and important it is for us as educators to share lesson plan ideas, and I think your website is a great resource. I found that my students were also having trouble with negative numbers so I designed an app for it and put it on the App Store. If you have an iPhone or iPad, you can take a look (it's completely free, since it's for kids). You can search for it by name ("negativity"). Let me know what you think, and would you mind if I added your idea in a future version? I had seen this done in another classroom, but couldn't remember how it went. Thank you so much for explaining both having the students physically walk and then also having a little person to do the walking. I am going to try this. I tried the "rules" and they are sooooo lost. I'm a 43 year old going back to college and trying to relearn math. THIS helped me! THANK YOU!!!! This looks like a great idea! Wish I found it a bit sooner, just finished teaching the rules for integers. I may save it for my other classes. A great visual of why we "add the opposite"